BEST SELLER! 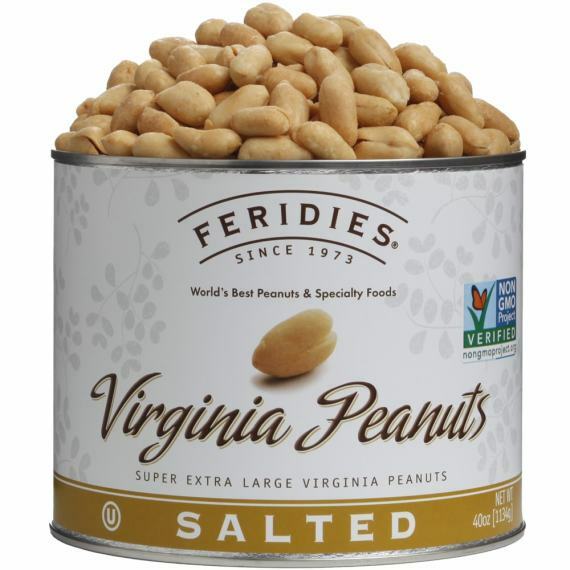 FERIDIES Virginia Peanuts are cooked in pure peanut oil and lightly salted to maintain the peanuts distinctive flavor and healthy qualities. If you have never had Virginia-type peanuts before, you'll be amazed at their large size, crunchy texture and delicious flavor. The 40 oz. 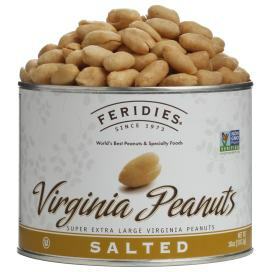 can of Salted Virginia Peanuts is by far our Best Seller! Shelf-Life is approximately 1 year if kept in cool, dry temperatures. The dimension of the 40 oz. can is 6" x 5". OU Kosher Certified and Non-GMO Project Verified. Save over 10% with the 4 Pack versus single can purchases. You are not going to believe the size of these peanuts. They are huge! Full and flavor and delicious. Love Them!! My husband received these peanuts the first time as a thank you gift from a corporate vendor at work. We have been ordering these amazing peanuts every year since then. I order the 4 pack/ 40 oz. cans of the salted Virginia peanuts twice a year and that's just for us. I also send them for Christmas and birthday gifts for others throughout the year. I wouldn't order peanuts from anyone else. The flavor is hands down unlike any peanut you will ever eat and the size of them is unbelievable. It's a feridies flavor explosion in your mouth. We were on the East Coast and were visiting friends who served us Feridies. I loved the texture and the size - they are so good and crunch and now we're addicted. I order a few of the 40oz cans a few times a year and keep them in the house as a staple - our guests always comment on how good they are and few of them now order direct, also. 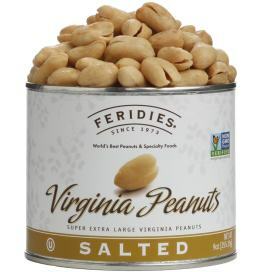 Where, in VA, do you sell these amazingly delicious peanuts? I've never tasted such scrumptious peanuts. Thanks.